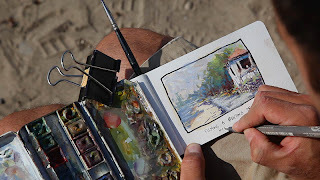 Marco's Stuff: Video Workshop - Painting Outdoors now released! Video Workshop - Painting Outdoors now released! I'm happy to announce that my Video Workshop: Painting Outdoors is officially released! I spent many hours this summer filming, recording audio, and editing to make sure it is a quality product. There are four painting demos in total, plus in-depth explanations of my outdoor setup and palette. For those who like to paint outdoors and/or for those wanting to learn more specifically about watercolor and wet media (gouache as well), this video is for you! Check it out here. I like your work very much! Bought it, watched it, and learned a lot. Thanks for all the insights. It finally got me painting 'non-digital' and lovin' it!